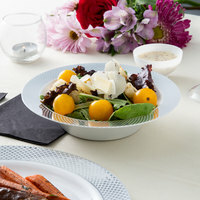 Our plastic bowls are available in a range of color and style options, so you’re sure to find options that complement the décor or your establishment or event. 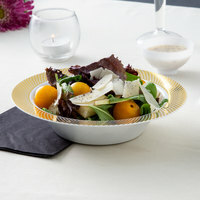 You’ll also find traditional round bowls, as well as square options that offer a more modern and chic appeal. If you’re looking for disposable bowls to use in formal settings, we offer styles with gold or silver rims, too! These plastic bowls have the convenience of disposability without sacrificing presentation. Many options are made to resemble actual glass or china but without the risk and fear of breakage! In fact, these disposable bowls feature shatter- and crack-resistant constructions that will withstand even the most rigorous environments. They can even be dropped without shattering into dangerous shards. For more great disposable products for your next event, check out our skewers, plastic flatware, and paper napkins. If you're wondering where to buy silver visions disposable plastic bowls, we have a large selection of silver visions disposable plastic bowls for sale at the lowest prices.